The next evolution of the drum, OASE filter technology provides crystal clear water through innovative pre-separation technique combined with effective bio-filter stage. Oase Introducw the New Oase BioTec Premium 80000 for 2015, its a smaller version of the popular Proficlear Premium Drum Filter, but the BioTec Premium 80000 comes complete with drum filter with a 150 micron screen and also a biological filter with 6 large, easy clean, foam filter elements, 4 course and 2 fine. The filter is flushed only by cleaned pond water. Therefore a fresh water connection is not required. Individually removable sieve elements (no tools required) and free-wheeling functions for easy access to the drum interior. The Oase BioTec Premium 80000 comes with a slide drain valve for easy draining off. This filter is designed to be pump fed with a maximum flow rate of 12,500 lph (2700 gph). Recommended for Koi ponds up to 20000 litres (4400 gallons). The innovative filter foams have a huge surface area are used post drum filter to house beneficial bacteria, helping to break down ammonia and nitrate, resulting in crystal clear pond water. The automated drum filter is removing solid waste particles before entering the foam media module, there for the sponges require far less frequent cleaning compared to more conventional filtration systems. The Oase BioTec Premium 80000 Filtration System is capable of processing ornamental ponds of up to 80,000 Litres (17,770 Gallons); Fish stocked ponds of up to 40,000 Litres (8,880 Gallons) or Koi ponds of up to 20,000 Litres (4,440 Gallons). 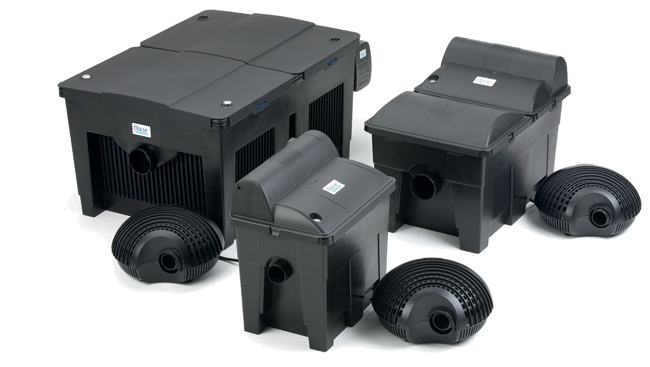 The new Oase BioSmart Set 7000 ensure optimal filtration for all garden ponds. The components are ideally matched, and for the most part they are pre-installed. The Oase BioSmart Set 7000 is an ideal introduction to proven OASE filter technology. The Oase BioSmart Set 7000 filter ensures clear and healthy pond water thanks to the combination of a large filter foam surface and integrated UVC technology (biological-mechanical cleaning). The Oase BioSmart Set 7000 intergrated UVC technology for safe elimination of algae and pathogens. Oxygen enrichment through special water channelling. The proven cleaning handles enable convenient filter foam cleaning, without removal from the filter. The integrated pollutant level indicator signals the right time for cleaning. Integrated sludge drain for simple removal of coarse debris from the filter. Water temperature display. The Oase BioSmart Set 7000 filter can be recessed into the ground up to 1/3 of its height. Ideally matched to the OASE Aquamax pond pumps. OASE offers a full guarantee of 2 years on these flow-through filters (except filter foams and bulbs). The new Oase BioSmart Set 14000 ensure optimal filtration for all garden ponds. The components are ideally matched, and for the most part they are pre-installed. The Oase BioSmart Set 14000 is an ideal introduction to proven OASE filter technology. The Oase BioSmart Set 14000 filter ensures clear and healthy pond water thanks to the combination of a large filter foam surface and integrated UVC technology (biological-mechanical cleaning). The Oase BioSmart Set 14000 intergrated UVC technology for safe elimination of algae and pathogens. Oxygen enrichment through special water channelling. The proven cleaning handles enable convenient filter foam cleaning, without removal from the filter. The integrated pollutant level indicator signals the right time for cleaning. Integrated sludge drain for simple removal of coarse debris from the filter. Water temperature display. The Oase BioSmart Set 14000 filter can be recessed into the ground up to 1/3 of its height. Ideally matched to the OASE Aquamax pond pumps. The new Oase BioSmart Set 24000 ensure optimal filtration for all garden ponds. The components are ideally matched, and for the most part they are pre-installed. The Oase BioSmart Set 24000 is an ideal introduction to proven OASE filter technology. The Oase BioSmart Set 24000 filter ensures clear and healthy pond water thanks to the combination of a large filter foam surface and integrated UVC technology (biological-mechanical cleaning). The Oase BioSmart Set 24000 intergrated UVC technology for safe elimination of algae and pathogens. Oxygen enrichment through special water channelling. The proven cleaning handles enable convenient filter foam cleaning, without removal from the filter. The integrated pollutant level indicator signals the right time for cleaning. Integrated sludge drain for simple removal of coarse debris from the filter. Water temperature display. The Oase BioSmart Set 24000 filter can be recessed into the ground up to 1/3 of its height. Ideally matched to the OASE Aquamax pond pumps. THE NEW BIOSYS COMPLETE SETS ARE HERE! The new OASE BIOsys complete sets ensure optimal filtration for all garden ponds. The components are ideally matched, and for the most part they are pre-installed. The combination of Aquamax filtration pump, Bitron UVC clarifier, and Biotec/Filtoclear, ensures guaranteed clear water. Through the simple installation and the modular extendability, the BIOsys sets are equal to all changes in the garden pond, such as increased fish stock, or new design ideas. The three system components of the BIOsys system, pump, clarifier and biofilter ensure that there is a natural bio-cycle in the garden pond and that the pond water becomes and remains clear. The Aquamax pump transports excess nutrients such as fish excretions directly to the clarifier/filter and also ensures a vital oxygen supply. The UVC light in the Bitron clarifier flocculates unwanted algae, making them easier to filter, while the magnet prevents the calcification of important functional components in the filter and pump. High-performance, low effort – convenience for pond owners. The new Biotec Screenmatic enables safer and easier removal of coarse substances from the pond. The solids are withdrawn from the filter system via an extractor sieve and are transported into a collection tank through a permanent cleaning process. This can be easily removed. The Screenmatic drive cleans the sieve continuously and guarantees sustainable flow. In this regard, we are dealing generally with flow-through filters and multi-chamber filters that filter pollutants out of the pond water not just mechanically, but primarily through biological processes. The colonisation of special microorganisms is a proven method for breaking down harmful substances. Biotec has been scientifically developed and tested, and when properly used in continuous implementation, ensures crystal clear water and optimum biological relationships. The Biotec 30 has been designed for large ponds, and particularly for ponds with koi stock. The Biotec 30 has a sludge drain for the removal of solids. The special filter surfaces enable rapid break-down of large quantities of nutrients. Thus, OASE has again been successful with yet another biological innovation. The Biotec 30 multi-zone filter has a new type of filter mat with varying thicknesses, in addi- tion to the brush chamber. This accelerates filtration of the coarse pollutant particles and helps the microorganisms in the rear part of the filter to do their work care-fully and effectively. 1 " - 2 "
The Oase Filtoclear – Combats dirt with pressure The OASE Filtoclear combines innovative filter technology with effective UVC clarifying. 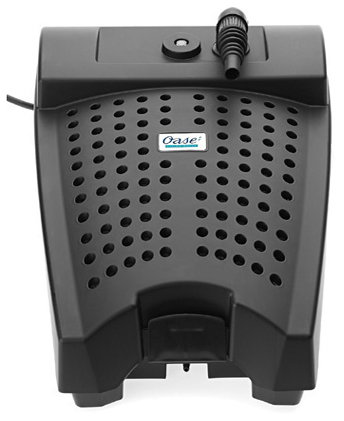 In addition, it is equipped with the unique and user friendly “Easy-Clean-Technology“ which makes cleaning the filter simple. The Oase Filtoclear has multiple talents. It can be installed either above water level or sunk into the ground beside the pond even if below water level. The pressure created by the filtration pump can be utilised to operate a stream or waterfall. The „Easy-Clean-Technology“ makes cleaning the filter simple! The Oase BioPress Sets gives you guaranteed clear water thanks to mechanical-biological cleaning combined with effective UVC technology. Included with the Oase BioPress Sets is the proven Aquamax 3500/5500 filtration pump. The Oase BioPress Set filter can be easily cleaned via the cleaning handle. Quick-lock provides easy filter opening and closing for maintenance purposes. Different filter materials for optimal settlement of filter biology. A higher elevated watercourse can be supplied with cleaned water. OASE provides a full guarantee of 2 years (excl. UVC lamp and foams) on the BioPress pressure filter if it is used correctly. Attention! Only suitable for small ponds. The Oase Filtral 5000 UVC in Pond filter is a compact filter unit with integrated 11 watt UVC technology for guaranteed clear water and 2500 l/h pump. Suitable for ponds with water volumes up to 5000 litres. The Oase Filtral 5000 UVC in Pond filter contains 4 different filter materials. Comes complete with 3 different nozzle attachments for individual water features. Telescopic extension for adapting the nozzle to the pond surface. T-piece for operating water features, with stepped hose adapter. Connection possibility for aeration pumps. Individual adjustment of flow rate and fountain height. Submersed installation, the attractive appearance of small ponds remains undisturbed. With the Filtral compact pond filters OASE offers a long awaited, multi-functional solution to owners of small ponds and pre-formed garden pools of up to 5000 litres. (1100 gallons). The Oase Filtral 5000 UVC in Pond filter is a a compact filter unit with integrated UVC and pump for attractive water displays. There is only one power cable leading into the pond, and no large filter system and hoses impair the look of the pond. The inlet strainer will accept particles of up to 8mm. Two different filter foams, biocores and filter stones ensures mechanical and biological cleaning. The OASE Filtral 5000 in-pond filter and UVC also includes 3 different fountain nozzles which will assist in adding vital oxygen to your pond. 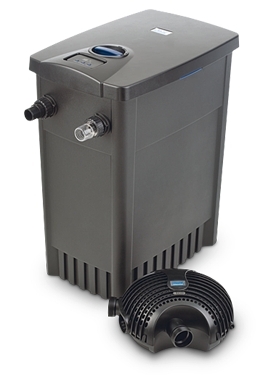 Compact filter unit with integrated 11 watt UVC technology for guaranteed clear water and a 2500 l/h pump. Suitable for ponds of up to 5000 litres. Individual regulation of the flow rate and fountain height. The Oase Start Filtral 5000 UVC is a compact in pond filter with a built in Ultra Violet light, ideal for installations where external filters are not possible or not wanted. Mounted internally in the unit is the Ultra Violet light to flocculate the green water algae to help produce crystal clear water. The built in indicator light lets you know when the light is on. This compact design avoids the need for messy hose runs and simplifies the electrically installation, with only one connection required. The water exits through the top outlet which includes an adjustable outlet connection, pivoting telescopic extension, 3 fountain nozzles (Vulkan, Lava and Magma) and a side outlet for running optional waterfall or ornament. Oase Biotec replacement foams should be changed one or two at a time to keep bacteria alive in the filter.